William Shakespeare once wrote "Ah you whoreson logger-head, you were borne to doe me shame," but it's doubtful he was referring to an actual loggerhead turtle, who couldn't possibly do anything to shame "The Bard." 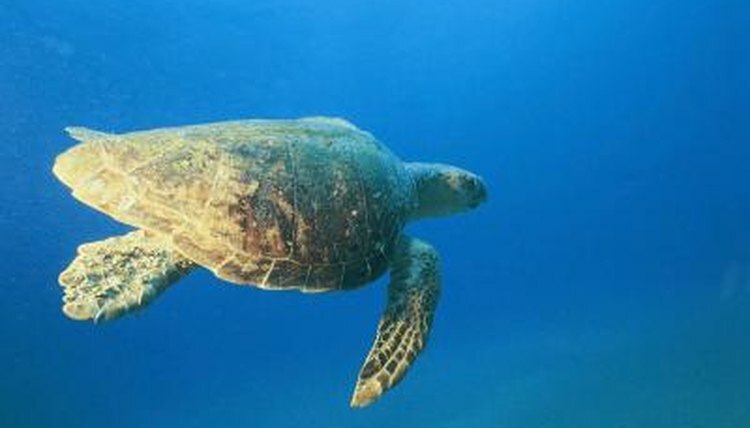 Loggerhead sea turtles are peaceful animals found in both temperate and tropical climes. Their status as a species is threatened, and five sub-species are endangered. The loggerhead's territory is far and wide, as loggerheads live in all of the world's oceans with the exception of the extreme arctic waters. They are often sighted just offshore because they prefer to hunt and live near the coast. They've been sighted hundreds of miles from shore as well and their travels take them through the deepest oceans and, for females, on land when the time is right. They've also been sighted in bays, lagoons, salt marshes and rivers. Some of their favorite hunting grounds include coral reefs and shipwreck remains, which create artificial reefs where life abounds. They are most abundant in the Atlantic, Pacific and Indian oceans, with the biggest population Loggerheads in the wild live more than 50 years, though their exact life expectancy is unknown. Loggerheads live in the ocean, but nest on land. Their habitat is the entire ocean, but when they are juveniles, they tend to "go with the flow," as strong currents carry them far and wide from where they first entered the sea as baby hatchlings. Atlantic loggerheads can be found as far north as Newfoundland and as far south as Argentina. The range of the Pacific loggerhead includes parts of Alaska and continues to the coast of Chile. Breeding occurs in the summertime and 80 percent of Atlantic loggerhead females come ashore to nest in just six counties in Florida; Brevard, Palm Beach, Martin, Broward, St. Lucie and Indian River. The Pacific loggerheads mate in the sands on the beaches of southern Japan. Marine mammals are warm-blooded and their body heat is maintained thanks to a thick layer of blubber. Turtles, however, are cold-blooded reptiles with no blubber and rely heavily on the ambient temperature to keep their metabolism going. Loggerheads can run into trouble if they happen to be passing through a usually warm location that suddenly turns cold. This tragic situation, called "cold-stunning" happened to a bale of 55 sea turtles caught in the Adriatic Sea when the temperature suddenly dropped, leaving 20 turtles dead and 35 fighting for their lives. Cold-stunning causes turtles to move too slowly to dive or hunt, causing severe debilitation. If the water temperature drops below 50 degrees Fahrenheit, stronger and healthier sea turtles will dive and stay close to the sea bottom where it tends to be warmer. They can do this for a short time, but they can't stay down there very long. The loggerhead sea turtle, like so many other sea animals, is in serious trouble due to trash in the ocean, commercial fishing, pollution and loss of nesting locations. The females come on land to build a nest by digging into the sand. They lays their eggs, and return to the ocean. When the eggs hatch, the hatchlings have an instinct to run towards the light of the moon so they can get into the ocean quickly. The lights from development along the coast confuse them, and so they run towards the road instead. During the nesting season, Floridians in the six counties most used by sea turtles, report seeing them dead on the road having been hit by cars because they went towards the electric lights instead of the moon. Illegal poaching of eggs and the deliberate harvest of loggerheads also contribute to their decline.